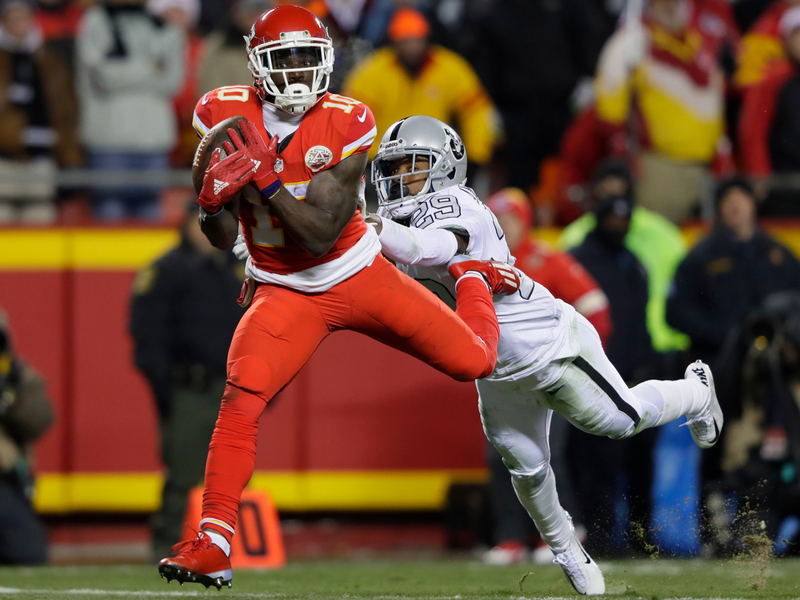 The Kansas City Chiefs grabbed control of the AFC West after defeating the Oakland Raiders, 21-13, Thursday night. Three things became apparent during and after Kansas City’s 21–13 win against AFC West rival Oakland on Thursday night. The first is that Kansas City, with its staunch defense and respected head coach and frustrating quarterback, is the only team in the AFC in New England’s class. The next is that Tyreek Hill has officially established himself as one of the most electrifying players in the NFL. And finally, with Derek Carr’s lackluster performance, the NFL MVP race is back to being wide open. First things first. The Chiefs have beaten their third straight playoff team, and their most recent triumph was against a team many believed to be the best in the conference. The Chiefs controlled the line of scrimmage Thursday night and outplayed and outcoached the Raiders for the second time this season. Kansas City (10–3) has won at Denver, at Atlanta and now at home against the Raiders to sweep the series while going 4–0 in the toughest division in football. The road to Houston may very well go through Foxboro next month, but the Chiefs are in prime position to get the first-round bye after Thursday’s win. In a season with several uber-talented rookies—Dak Prescott, Ezekiel Elliott and Joey Bosa—standing out around the league, Tyreek Hill has made a name for himself as the fastest and most dangerous returner in the league. Hill hit a top speed of 22.77 miles per hour in Kansas City’s overtime win against Denver two weeks ago and probably equaled that on his 78-yard punt return in the second quarter. Hill’s return, which included running through an arm tackle by America’s favorite punter Marquette King, ensured the Raiders wouldn’t kick to him the rest of the night. It also marked his second score of the game. Earlier in the quarter, he scorched by cornerback David Amerson for a 36-yard touchdown pass from Smith. There is an unpleasantness among some football fans who revel in Hill’s speed, though. He’s a year and a half removed from pleading guilty to beating and choking his pregnant girlfriend while at Oklahoma State. Hill had to take an intervention course and has another year-plus left on his probation. The Chiefs had to hold a press conference after drafting him in the fifth round to assuage any fears that they don’t take domestic violence seriously. As the Chiefs march toward an AFC West title, Hill will continue to run away from defenders and his past. Finally, Carr laid an egg on national television as his MVP candidacy took a blow. He threw 117 yards on 41 attempts, giving him a pass-per-attempt rate of less than pi. Latavius Murray pounded out 103 yards on the ground, which is good enough to open up the passing game even against a great secondary like the Chiefs. But Carr—who didn’t get much help from WR1 Amari Cooper—had his worst game in a season where he already had two games with less than 200 passing yards. Carr had an opportunity to put the clamps on the award in his third year. Now there are as many as six players who can lay claim to it. Prescott, Elliott, Carr, Tom Brady, Matt Stafford and even Matt Ryan are all in the hunt after Carr’s failure to put his stamp on it. Nevertheless, Kansas City was the story of the game and not some year-end individual award. The Chiefs—with their confusing quarterback, troubling but dangerous returner and will-imposing defense—made their statement Thursday night.